This page will gradually be developed as I complete my write up of our trip diary, along with reviews of the guide books and maps we used while in the USA and Canada. After our first trip to the USA in 2015, then our second in 2016, once again we found ourselves drawn back to the USA in 2017 – however this time we crossed the border into Canada too! Given the time of year we contemplated how far north or inland we could travel and in the end we decided on the Pacific Northwest and a quick jaunt into Canada. We used Seattle as the start and end point of our route flying from London Heathrow. 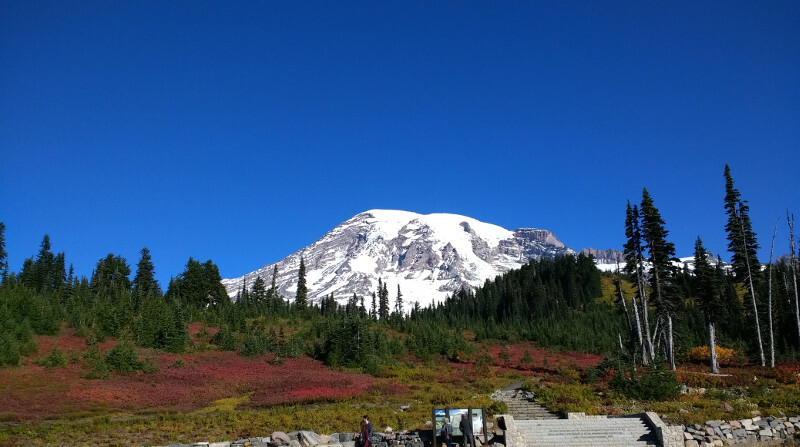 On arriving, we headed straight to Mount Rainier National Park. We then drove north to Levenworth, Lake Chelan, and then east to the Grand Coulee Dam. From here we headed back west along Highway 20 and on to the Mount Baker Highway. After driving to Glacier Point we headed north and crossed over into British Columbia, Canada, with a stay in Vancouver and then onto Vancouver Island. From Vancouver Island we headed back south into the USA on the ferry from Victoria, Canada, to Port Angeles, Washington, USA. Our first stop back in the USA was the Olympic National Park. We then travelled south through Washington state and into Oregon over the Astoria Bridge and onto Crater Lake National Park. From here we went along the Cascade Loop highway and the Mackenzie Highway visiting Sisters, before travelling east towards the John Day Fossil Beds National Monument. From here we went north to Mount Hood and the Columbia River Gorge and then onto Mount St Helens before finishing off back in Seattle for a couple of days. It was another great trip to the USA and although we kind of squeezed Canada in just to explore it a little it was definitely worth it. In total we covered just over 3000 miles in just under 3 weeks. The scenery was extremely varied from snow topped mountains and very cold weather at the top of them (! ), to sunny skies in Vancouver and desert landscapes down in Oregon at the John Day Fossil Beds.